The advances of mobile technology and web-based software have provided users with on-the-go and round-the-clock access to software programs like never before. These tech trends allow niche B2B systems such as the ever-growing CMMS software market to increase in popularity. Computerized maintenance management systems (CMMS) no longer adhere to a one-size-fits-all approach; rather, CMMS is made up of custom features delivered through flexible platforms. But which CMMS requirements do most platforms offer? Although features continue to innovate and change, core CMMS functionality developed 25 years ago remain an essential backbone of any program. Growth has also stemmed from the development of feature-rich software catered to specific industries and user groups. Maintenance management software is now applicable to virtually every industry that relies on its facility and critical equipment to deliver its core offering. But to make sure you get a platform with all the CMMS software requirements your organization needs, we’ve compiled this list of the most important CMMS features to help with your CMMS selection process. Apart from pure work order management, a CMMS functions as a maintenance database. It stores a wide variety of data, from asset and equipment information such as documents, images, warranty info, serial numbers and installation dates to spare parts information. No longer do organizations have to shuffle through filing cabinets to find critical O&M manuals or walk over to an asset to read its ID tag. Asset management modules offer a range of features for keeping tabs on your assets. All information related to asset management can be accessed through the system via different interfaces such as interactive floor plans for accurate asset mapping, a standard grid format or even the a calendar interface. Work orders are the hub of any maintenance management system. In addition to providing a digital form to replace traditional paper-based work orders, a CMMS work order management module acts as the central component to your maintenance database. All asset and equipment information, including documents, ID tags, equipment images, spare parts information and much more can be associated with work orders making it an agile communication tool in your maintenance department. With a work order management module, users can assign tasks to specific users and give them priorities, track them through the completion process, and schedule them to ensure everything is running smoothly and efficiently. Everyone will know what needs to be done and by whom — no emails required! But if you want email notifications when a task is complete or moved to another stage, many CMMS solutions offer automated alerts. Digital work orders are also flexible, allowing users to update and modify information such as its status or description fields quickly and easily. Users can assign role-based access to the work order user portal to determine who can open, work on and close work orders. This way, the chain of command is always obvious and communication is seamless. Buyers love this feature — in our recent CMMS survey, 86 percent of respondents listed work order management as one of their top features. If fixed assets, tangible assets, or property, plant and equipment make up a significant portion of your organization’s activities, you deserve a sophisticated management system to keep tabs on them. That’s where fixed asset management comes in. Rather than waiting to repair assets once they’ve failed, asset management functions allow you to monitor the depreciation and mean time between failures to better predict and prevent issues. You can also get organized by storing important information on asset transactions, procurement and costs within the asset management module. Many CMMS platforms allow users to upload documents like images, warranties and maintenance records to store directly in the asset management interface, reducing the need to bounce between screens and streamlining workflows. CMMS buyers understand the importance of this feature. In a survey of customers purchasing CMMS software, 69 percent requested asset management functionality. Similar to asset and equipment management, inventory management helps businesses organize and track their spare parts. Too often, organizations misplace or run out of parts in the middle of repair on a critical asset, leading to increased equipment downtime and overall productivity decline. Inventory management is an essential feature to manage large-scale maintenance operations with numerous pieces of equipment. This feature can go above and beyond simply cataloguing your inventory. Stockroom management includes custom-made barcodes and QR code scanning capabilities to make the organization process a breeze. Never use a clipboard again! Your CMMS can even set automatic reordering reminders or perform cycle counting in which a certain segment of inventory is counted each day, reducing or even eliminating the need for physical inventory. Want even more robust features? Some CMMS systems even offer advanced options like inventory forecasting to predict what kind of inventory you’ll need in the future or multi-site inventory for organizations with multiple facilities. If you know your needs, there’s a CMMS out there that can meet them. If you have CMMS software, you don’t need to leave your purchasing entirely in the hands of any one employee. 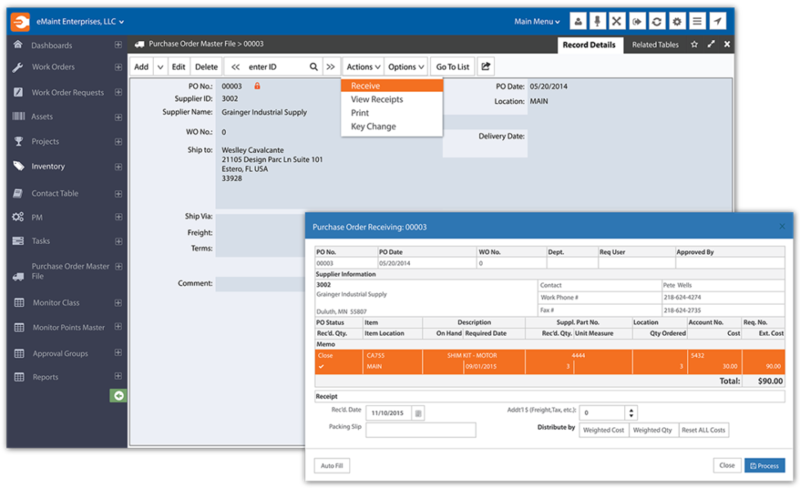 With a procurement management module, users can create purchase requisitions directly within the system without having to send an email or other communication to the purchasing agents. This streamlines the process and reduces the chances of missed emails or failures in communication. Do you need to order the same parts over and over again? Never miss an order when you set up automated purchase orders in your CMMS. Once purchase orders have been submitted, your CMMS can automatically match them to the corresponding invoices when those orders are received. Program management is an umbrella term for all the tasks and activities that impact a business’ performance. CMMSs with this type of functionality offer features above and beyond the basic maintenance management features. Tired of using Google Drive or a complicated, disorganized file system to store your documents? Look for a CMMS with document management functionality. While some organizations may need a separate system to manage their budget, if you have a relatively straightforward operation or are an SMB, you may find the program management module of a CMMS more than proficient. This can also be said of your labor resource directory and timecard management. If you don’t have to integrate a complicated timecard system into your organization, why would you? This function gives users the options to keep it simple and stick with a single software. Preventive maintenance management is a must-have among the majority of buyers looking for CMMS. In our recent survey polling over 160 CMMS buyers, 23 percent wanted to be proactive in their maintenance repair by utilizing predictive maintenance. Another 71 percent were extremely interested in preventive maintenance. Preventive and predictive maintenance allows work orders to automatically generate on a given schedule, outlining tasks to properly inspect or clean critical equipment. Performing scheduled maintenance on your assets has demonstrated enormous cost savings by increasing equipment uptime and the longevity of assets by an estimated 20 percent. Without a CMMS, preventive maintenance automation is almost impossible to track. Preventive maintenance modules will often contain information to ensure regulatory compliance, reducing the chances of failure as well as improving the safety and longevity of assets. Users can also create task templates to reduce the need for menial data entry every time a repetitive task needs to be performed. Materials management can deal with a range of specific requirements. Whether you are tracking materials coming to or going from your facilities, keeping tabs on hazardous materials or allocating those materials to proper channels, CMMS has you covered. Users can utilize custom fields to classify items and organize everything within the system without ever navigating to a new program. Never worry about your records being lost and reduce the number of systems and screens you have to navigate between when you store them directly in your CMMS. Materials management modules offer audit logs to ensure security and regulatory compliance so you’re always sure you’re meeting maintenance management standards. Business intelligence tools are becoming more ubiquitous even as you read this. You may think you don’t need anything as fancy as BI — only 10 percent of our surveyed software buyers said they wanted it in their CMMS — but you might be surprised by its usefulness. Reporting tools help provide a snapshot into the everyday goings-on of your business and can offer valuable insights. Do you want to know how cost-efficient your assets are? Generate a asset cost utilization report? What about an analysis on the failure rates of assets? Reporting can do that too. Some CMMS platforms offer industry-specific reporting capabilities, and others leave the ball in your court by offering custom reporting and dashboard features. This allows users to specify the type of report they want to generate based on specific KPIs. If you want to work smarter instead of harder, reporting is the place to start. The use of CMMS mobile capabilities has seen significant growth over the last 5 years. Starting as an innovative new feature of CMMS, mobile is now a common function of any maintenance system. Maintenance technicians in particular are able to leverage mobile app benefits by accessing their work orders in the field to check off tasks, enter their total project hours and much more. A CMMS app reduces human error, eliminates the need for paper and decreases the time between jobs as technicians can refer to their mobile job list instead of checking in with superiors. As more and more buyers continue to ask for increased mobile capabilities, CMMS apps are expected to become smarter and more comprehensive in the future. Functions such as syncing real-time phone alerts with machine inspections and providing an increasingly user-friendly interface to view and edit information will quickly grow in popularity. The best CMMS systems are ever-evolving, developing new features to stay on top of current industry trends. The fundamental features of work order management, preventive maintenance, and asset and equipment management, however, remain consistent. The difference now comes in the form of advanced features, more user-friendly maintenance system aesthetics and web-based delivery methods. Although a majority of maintenance managers refer to these features as the most important, this is by no means an exhaustive list. Proper research and vetting of various software vendors will help organizations performing CMMS platform evaluation to develop their own list of CMMS platform requirements for a tailored and comprehensive software experience. Did you find this list helpful? Were there features you didn’t expect to see? Did we miss any? Let us know in the comments! Selecting a CMMS can be an overwhelming task, especially when so much rides upon the success of CMMS. You can read reviews and select a CMMS based on those, but the CMMS may not be the right one for you. The CMMS has to be fit for your business / operation or you will not see the right results. Thankfully there are two ways to select the right CMMS.